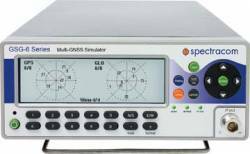 Spectracom has introduced two timing-related products, the GSG 6-Series GPS/GNSS simulator for testing receivers’ timing capabilities and the SecureSync Timing Reference with enhanced Loran (eLoran) backup capability for GNSS. The company’s off-the-shelf GSG 6 units support supports dual-frequency (L1/L2) GPS receivers and military secure SAASM modules with pseudo P(Y) code as well as the new GPS civil signals, L2C and L5; legacy GNSS L1 (GLONASS, BeiDou, and Galileo) signals and other new GNSS signals: GLONASS L2, Galileo E5, BeiDou B2; and Indian Regional Navigation Satellite System (IRNSS) L5. A built-in one pulse per second (1-PPS) output, synchronized to the generated satellite data, allows comparison with the 1-pps signal from the timing receiver under test, Spectracom says. The series comes in GSG-6: 32-, 48-, or 64-channel versions capable of simulating, respectively, 2, 3, or 4 frequencies simultaneously. The simulators feature a timing calibration service to characterize the offset within 1 nanosecond — with a 0.35-nanosecond uncertainty, according to the company. The new SecureSync option is configured with GNSS as the primary timing source. If GNSS satellite signals are lost, eLoran is used for synchronization. When the primary GNSS reference is restored, then the SecureSync system reverts back to it, according to the company. The system incorporates an UrsaNav UN-152B eLoran timing receiver in a 1U 19-inch rack enclosure.